"This is Dave's favorite brine for Thanksgiving turkey. It can be used on any kind of poultry and pork. It gives a sweet, maple flavor to meats." Place 2 quarts of water in a large pot over medium heat, and stir in brown sugar, soy sauce, maple syrup, sea salt, garlic cloves, bay leaves, thyme sprigs, peppercorns, and whiskey. Stir to dissolve brown sugar and salt; bring to a boil. Remove from heat, and stir in remaining 2 quarts of water. Allow brine to cool completely before using. Tender butternut squash is topped with a simple maple-rum glaze. 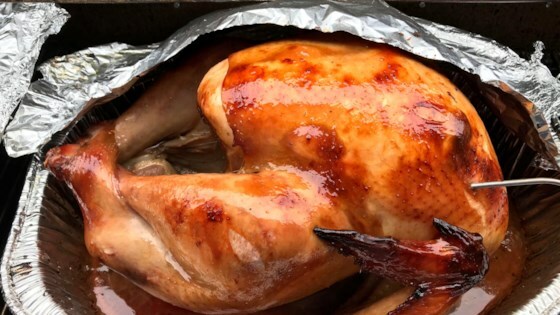 The best and most moist Turkey we have ever had. We will use this every year!! !